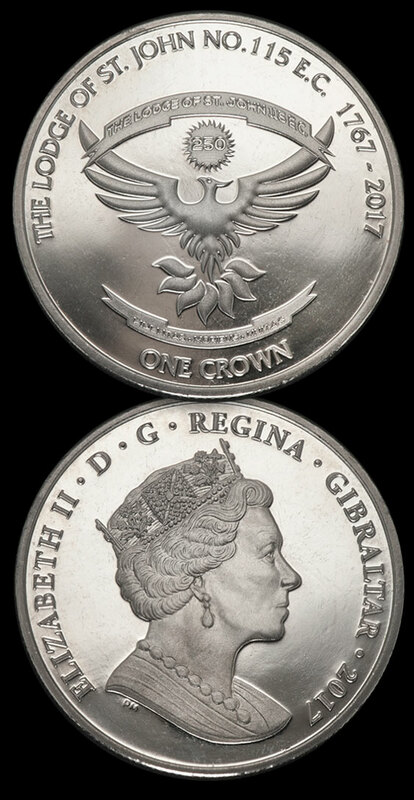 To commemorate the 250th Anniversary of the Lodge of St John No.115 EC, a crown coin has been issued. The coin depicts the lodge's logo, is limited to a mintage of 7,500 and is sold within a capsule. The Lodge of St. John was first warranted by the Atholl or Antient Grand Lodge on the 5th September 1767, at Perth, Scotland, as a military travelling Lodge No. 148 in the 2nd Battalion, Royal Artillery. The Battalion was moved shortly after to Mahon, Minorca, Balearic Islands, then a British possession and in 1772 was posted to Gibraltar bringing with it its ‘Antient’ warrant No. 148.